Volunteer at Shaver’s Creek | Nature Programs—Events—Trail Work—etc.! Volunteering your time and energy is another great way to support Shaver’s Creek. Our typical areas of need for volunteers include animal care, grounds, trails, facilities, public programs, and special events. Submit the following form to express your interest in volunteering at Shaver’s Creek. Volunteers are the backbone of Shaver’s Creek Environmental Center — there is always work to be done! We rely heavily on the skills and labor of student, community, and retired volunteers for a wide variety of tasks. To get started, please begin answering the questions below. Why are you interested in volunteering at Shaver's Creek? In what area are you interested in volunteering? The amphibian, reptile, and raptor animal ambassadors that live at Shaver’s Creek Environmental Center serve as a teaching menagerie for Penn State students and engage our community as conservation ambassadors. A distinct feature of Shaver’s Creek, the daily care, training, and educational programming with the animals requires a dedicated team of Animal Care staff, Penn State students, and volunteers from the community. We are always seeking new volunteers that are willing to accept the great responsibility and embrace the incredible opportunities that come from working with these fellow earthlings. Our goal is to provide the highest quality care and training to our animals, while providing a hands-on learning experience, buoyed by a solid foundation of natural history & behavioral science for Penn State students interested in pursuing a career with animals in nature centers, zoos, and aquariums. We have also engaged students from Juniata College Saint Francis University, and College of the Atlantic by providing internship opportunities to complement academic studies. Animal Care is not for everyone. Along with the privilege of working with our collection of native Pennsylvania wildlife, comes dirty work, sub-zero temperatures, and summer heat. There are no days off in Animal Care program - we are active 365 days year! However, if you are willing to make the commitment, then we can assure you that you will have an experience you will never forget at Shaver’s Creek Environmental Center. Alright, I’m ready to get started! How do I begin? Shaver’s Creek participates in a number of citizen science projects that take place on-site and off-site. Some projects desire volunteer assistance and are capable of individuals and groups creating their own accounts for the classroom, backyard, and everyday adventures. Visit the citizen science page on our website to see a list of current projects or information on how to get started on your own, or contact Jon Kauffman at jvk5019@psu.edu with the project(s) you are interested in and time availability. Shaver’s Creek Environmental Center resides in the 7000-acre Penn State Experimental Forest. Tree plantations, native and invasive plant species, 25 miles of hiking trails, garden areas, meadows, and a 72-acre lake all share the neighborhood. As a Grounds and Facilities Volunteer, this neighborhood is your work area. We are responsible for the look of the Center and the safety of our guests. We ensure that the trails are clear, the bridges are safe, and that the grounds are tidy. We weed the flower beds and mow the lawn. We remove invasive plants, such as autumn olive and garlic mustard, and give native plants a chance to thrive. We create props for festivals and keep exhibits in excellent working order. We are the crew behind the curtain that makes sure that the show goes on! I am ready to start. What's next? With all of the trails, landscaping, and other natural areas around Shaver's Creek, there are a lot of projects to do to keep the place in tip-top shape for visitors. The work never stops and the type of projects change from season to season. In the Winter, the focus is on indoor projects such as painting and sign repair. Spring is a time for trail maintenance, bridge repair, and planting. Trail maintenance continues in the summer and Fall, and the weather is perfect for outdoor painting projects and flower bed upkeep. Invasive plant management is a year-round project, targeting specific plants at specific times of the year. The variety and amount of projects we offer is ideal for any organization to earn service hours! What will my group be doing? We are ready to start. What's next? - Sign your group up for a work project: 2019 Volunteer Work Projects. Please remember to fill out the name of your organization, the person we need to communicate with, and an email address. Also please remember to select from the pull-down menu how many people may be coming (max 30). We'll send you more information about the date and project that your group will be doing once you sign up! 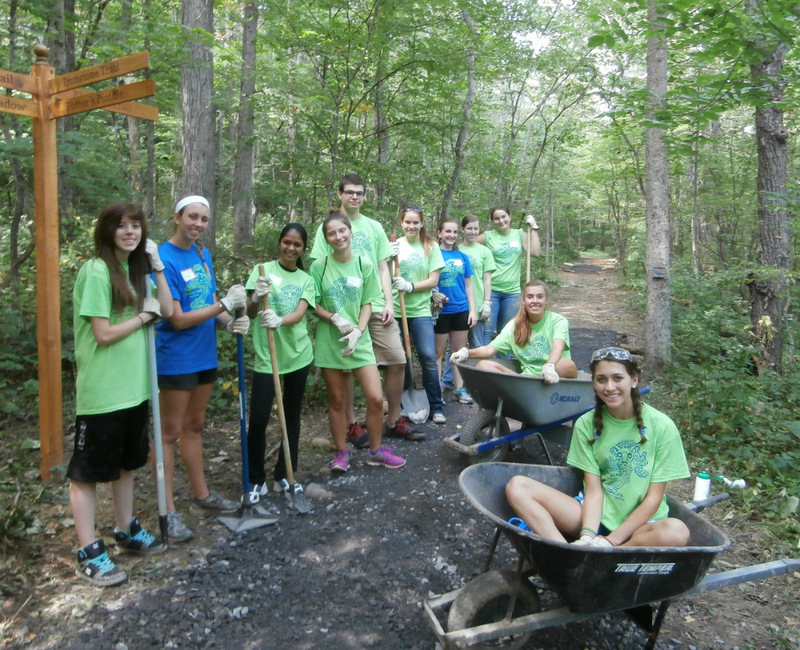 Volunteer opportunities for Shaver's Creek Grounds and Facilities qualifies for judicial affairs service hours and class appointed service hours. Please visit this form to continue. We are looking to recruit some volunteers for the 2019 Maple Harvest Festival, which is March 23rd and 24th, from 10:00 a.m.-3:30 p.m. both Saturday and Sunday. This event would not be possible without the help of volunteers and we need some fun people to help make this weekend great. Pancakes with maple syrup will be provided and we ask that volunteers commit to a 4-hour time slot during the course of the weekend (9:00 am-1:00 pm OR 12:30-4:30 pm. We have a multitude of different volunteer positions including greeting guests, parking, food service prep and clean-up and working with our zero-waste efforts. Let us know if you are available and interested in volunteering. Please contact Matt at mjw5718@psu.edu. Check back later for more information on volunteering with educational programs at Shaver's Creek. Visit the Summer Camps page for more information on our Leaders-in-Training program. The LIT program is for ages 14–17. If you are experiencing issues with the registration form (it should be right above this text! ), please refresh the page. We are currently working to solve the issue.